Last week I had the honour of representing CIOB at the RMIT University, School of Property, Construction and Project Management, Annual Industry Research and Awards Night (Melbourne, Australia). 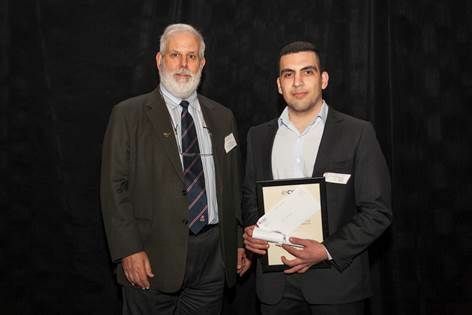 I was there to present the CIOB QEII Award to Chris Mikha, the CIOB Student member who achieved the highest average over the Construction Technology course in the RMIT Bachelor of Applied Science (Construction Management). The element of the evening that most impressed me was the breadth and depth of research undertaken by the School’s Honours students. As part of the final year research component of the Degree, the students produce create a poster as an info-graphic highlighting their research findings. Looking at the quality of the posters, out industry has a lot of talent joining its ranks! The other key impression left on me was the success of the annual CIOB Global Student Challenge, Chris’s team missed out on a place in Hong Kong this year by a small margin but he though the challenge was one of the most important leaning experiences of his entire course. The decision by CIOB to take the game ‘global’ a few years back has certainly paid off! Overall a very successful night all round. This post is my second discussing Ashurst Lawyers fourth report in the ‘Scope for Improvement’series looking at the management and delivery of mega projects in Australia; focused on the interlinked topics of productivity, innovation and training (read the first post). Major inhibitors are the heavily regulated labour market and restrictive work practices. This is a management failing, enterprise bargaining has been part of the Australian industrial system for nearly a decade. Inadequate or insufficient training, and lack of experience, particularly in project and risk management of large projects, have been evident. . This is another management failing, skills don’t magically develop in ‘the market’ organisations need to invest in training. There is a generational shift in talent and experience at project director level. Developing ‘young talent’ needs career planning – largely ignored in the construction sector. There is not enough talent in the market to adequately cover the step shift in project scale (typically up from $800 million to $2billion) that occurred in the mid-2000s. Long term skills development has been largely ignored in this sector. More depressing, was the complete absence of any meaningful discussion on BIM – Building Information Modelling. BIM is now mainstream in the UK construction industry and gathering pace in the USA, China, Europe and many other countries (many of which have contracting footholds in the Australian market). The reason the rest of the world is focusing on BIM is productivity and profit. BIM reduces risk, increases efficiency and substantially reduces cost. BIM has a similar enabling capacity to EFPOST in the retail industry. The development of fully integrated data, driving efficiencies right through the supply chain – with EFTPOS, the suppliers know how many stock items have been sold today to arrange restocking overnight; JIT with a vengeance. BIM offers similar opportunities to radically reform and update the construction industry and drag it from its medieval craft roots into the modern era. Implementing BIM will be a cultural revolution in the Australian context, making the optimum use of BIM will require skilled staff working as permanent members of the construction business’ supply chain. Successfully implementing BIM will require investment, training, staff development and a major shift in workforce management and supply chain management. The challenge facing Australian companies in all parts of the industry is to either catch up with their global competitors or face extinction. The problem is a unlike the UK, there is no government leadership and we do not have the market size that allows innovative investments in Europe, China and North America. Solving this conundrum is where the real ‘scope for improvement’ lies. The second annual NBS National Construction Contracts and Law Survey was carried out in June in July 2013. Undertaken with the help of the membership of more than 20 industry bodies, the survey of over 1,000 clients, contractors and consultants found that 30% had been involved in one or more contract entering into dispute in the last 12 months compared to 24% in the previous year. It is also clear from the NBS survey that many disputes involve large sums of money and have a significant effect on the construction process. Respondents were asked to identify the main causes of disputes in 2012, with “extensions of time” being named by just under half the sample, at 49%. Other reasons included defective work, named by one in three (32%), valuation of interim payments (16%) and contractual terms (6%). Another question asked the sample to identify the issues that had caused most problems during the construction phases of projects in 2012. “Assessment of delay and extension of time” emerged as the most problematic issue, identified by 44% of clients, 63% of contractors, and 48% of consultants. 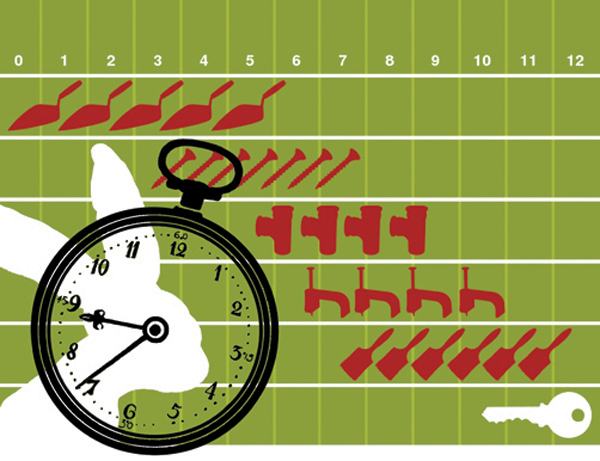 “Lateness in payment” was named by 9% of clients, 34% of contractors and 20% of consultants. On actual disputes, 70% said that none of the projects they worked on in 2012 had seen a dispute, by 17% had been involved in one disputed project, 6% had involvement in two, and 7% had been involved in three or more. The survey found that collaboration was far from the norm, and therefore failing to reduce the number of disputes. 49% of those questioned said that they had not used any collaboration techniques on projects that started in 2012. When the remaining 51% was questioned further on collaboration, 32% had worked on projects with formal partnering arrangements, 12% on projects with alliancing agreements and 20% on projects with non-binding partnering charters. But the most common form of collaboration was “a contract that included the ethos of trust and mutual collaboration”, at 61%, although the report’s authors question how effective this would be. One solution to this problem launched in 2013 is the new CIOB Complex Projects Contract which includes the requirement for effective schedule management (read the post) and is backed up by the CIOB PTMC time management certification (see more on the certification). The Chartered Institute of Building (CIOB) has been working to advance the profession of construction management for nearly 190 years and this work is continuing apace. At its series of annual meetings held in Yorkshire in June, several major developments were moved forward significantly. Work of many years to define and differentiate construction management from project management also took another step forward. Construction management is a broad discipline focused on the creation, maintenance and eventual disposal of assets in the built environment (see the CIOB Definition). Project management focuses on the efficient execution of a project. There are obviously many construction projects where the two disciplines overlap, but construction management is extends to be involved with the work of the client prior to the initiation of the project and to facilities management once the asset has been built. (For more on the difference see Construction Management -v- Project Management). In June, a resolution to recognise Chartered Construction Managers was passed at an EGM and is now awaiting ratification by the Privy Council. With the formal recognition of CIOB’s qualifications, the definition of construction management and the work to have the designation Chartered Construction Manager nearing completion the standing of the profession in the 21st century has been significantly enhanced. A paper I have planned for 2014 on the ‘Origins of Construction Management’ will argue that this discipline has been at the forefront of the development of management practice for over 5000 years and the good work continues. The next area of ongoing development is Building Information Modelling (BIM). 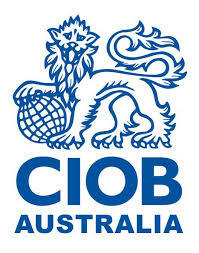 The CIOB is at the forefront of the work to bring this game changing way of working into general use. The overall BIM framework closely matches the concepts of construction management discussed above focused on achieving through life efficiencies in built assets. In April, CIOB launched the first general form of contract specifically designed for use on projects implementing BIM (see more on CPC2013). For more on BIM see our White Paper and visit the UK BIM Taskgroup. Closely aligned to the efficiencies promised by BIM, CIOB’s Carbon 2050 initiative has also been refreshed. Carbon 2050 is a suite of tool designed to help any organisation from designers and consultants to general contractors implement plans to reduce their carbon footprint. For more on Carbon 2050 see http://www.carbonaction2050.com/. Finally a number of initiatives were discussed to enhance the project time management framework and promote access to the Project Time Management Certificate. These initiatives are expected to be in place before the next two courses scheduled for Perth on the 30th Oct. and Melbourne on the 20th Nov. For more on the PTMC accreditation see http://www.mosaicprojects.com.au/Training-CIOB_PTMC.html. This has been a busy couple of months but overall great progress has been made on a number of key initiatives. Launched on 23 April, the Complex Projects Contract 2013 (CPC2013) focuses on managing time to ensure projects are delivered to specification on budget and without delays. Unlike existing contracts, which target failure by requiring financial compensation for late completion, CPC2013 provides the procedures to enable parties to manage time, cost and risk events in a modern and proactive fashion. It is also the first standard form contract to cater for Building Information Modelling (BIM) and the future of collaborative design. Speaking about the contract, Keith Pickavance, a Past President of the CIOB and lead author of CPC2013 said: “This is a modern day contract designed for the data age. It underlines and meets the need for a collaborative and competent approach to how risks are managed utilising transparent systems of data. It can be used with, or without, Building Information Modelling and has been drafted to work in any country and legal jurisdiction around the world. The causes and consequences of delay are the single most common reason for uncontrolled loss and cost escalation in complex building and engineering projects”. Unlike many forms of contract, CPC2013 doesn’t favour one party over another and is disencumbered by any vested interests. The contract is designed for projects of high value or complexity such as major real estate, engineering and infrastructure projects, with an experience client focused on achieving success. Amendments would be required to use the contract for ECPM and ‘construction management’ contracts. Current standard forms of contract do not encourage, and in some cases actually inhibit, the competent management of time making them unsuitable for controlling the risk of time and cost escalation on complex projects. According to CIOB research, 67% of complex building projects were completed late, 49% were up to 6 months late and 18% were completed more than 6 months late. Time management experts can pinpoint the causes for these through careful analysis but by then it’s usually too late; the damage has been done and the parties are left counting the costs of late completion (or worse). Taking a different approach, CPC2013 is designed to substantially manage, reduce and avoid time and cost risks contemporaneously though collaboration and transparent and effective tools. Whilst the quality of the programme is paramount, the key lies in understanding that it is not enough simply to hold the parties to fixed points in an agreed programme for the works. With this in mind, CPC2013 concentrates on ensuring that sufficient information is communicated to manage time effectively and deal with variances from program regardless of the cause. It requires detailed record keeping of actual process against the schedule, including resource utilisation and productivity to help project participants understand and manage time risks as early as possible. Quality assurance processes govern the preparation and maintenance of a dynamic programme (called the working schedule) and there are direct links between claims for extensions of time and the working schedule and the contractor’s specified methods of working. The parties must deal with the approval or rejection of the contractor’s submissions early on rather than leave these unresolved and, consequently, potential breeding grounds for later disputes are minimised. A project time manager, with a duty to act fairly and reasonably, helps advise on, and oversee, these processes. CPC2013 is the first construction contract to be ready for Building Information Modelling (BIM), the modern digital standard for collaborative design. Maintaining this 21st century feel, communications between the parties are addressed through email, file transfer protocols and a common data environment. Elsewhere in the contract, provisions cover deleterious and hazardous materials and the involvement of an expert aids the mitigation and quick resolution of disputes during the works. CPC2013 also caters for construction both on a design and build and a works-only basis, and can be used overseas as well as in the United Kingdom. Einstein once said that it was not possible to change the world without changing our thinking. There’s little doubt CPC2013 may ruffle a few feathers, but its bold approach to time management is one which must be taken if contracts are to be routinely completed on time and on budget. This is not the first time the CIOB has been involved in developing forms of contract. Back in 1871 the Institute with RIBA published the very first standard form of construction contract. The contract is part of the CIOB’s agenda to establish a culture of effectively managing time in complex projects. In 2011 the Institute published the ‘CIOB Guide to Good Practice in the Management of Time in Complex Projects’ which was followed by the CIOB Project Time Management Certicication in 2012 (For more on these topics see: http://www.mosaicprojects.com.au/Training-CIOB-TM_Credential.html). The meeting to formalise the closure of the Australian Performance Management Association and discus the formation of a less structured network for project controls professionals will be held on the 9th April 2013, at the Rydges Capital Hill, Canberra, ACT. The AustPMA – Final Meeting is being held in conjunction with the Project Controls Community Evening (free event) which will start at 6:00pm to conclude at approximately 7:00pm – a cash bar will be available from 5:30pm. A brief presentation on developments in the International Standards Arena (ISO) and the work of the ISO Technical Committee focused on project, program and portfolio management. An update of the CIOB contract for ‘complex projects’ and its approach to proactive time management. An open discussion on the ‘way forward’ to establish a dynamic community of project controls professionals in Australia, effectively linking the work of the AIPM Controls SIGs, the Governance and Controls Symposium, the College of Performance Management, Planning Planet, and any other group working to advance skills and knowledge in this important discipline. The costs of the room hire are being covered by the not-for-profit, PM Global Foundation, the organisers of the Governance and Controls Symposium that will be in the same location on the 10th April. Or email me to request copies at patw@mosaicprojects.com.au (many of you have moved and we don’t have your current email). Regardless of your involvement with AustPMA in the past, we cordially invite all project controls professionals and interested project managers to attend this free community meeting to network and discuss the future direction of our discipline, as well as bidding a short but fond farewell to the AustPMA. To assist in organising, please register for the free Project Controls Community Evening at: http://wired.ivvy.com/event/GCSM13/ (scroll down page for details).